That’s a 128 pixel photo, pretty small huh? So I modifed the code to create 450 pixel thumbnails. That’s more like it at 450 pixels.Here’s how I did it. 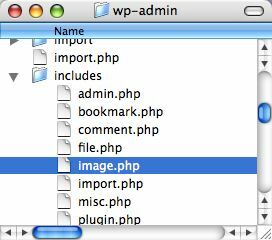 In your wp-admin folder is an includes folder and inside that is a file called image.php which is the file we will be modifying. This is the old code that has the thumbnail size set to 128 pixels. It’s on line 153 of the file. This will display the 450 pixel thumbnail on the page and link to the bigger original image uploaded when people click on the thumbnail. 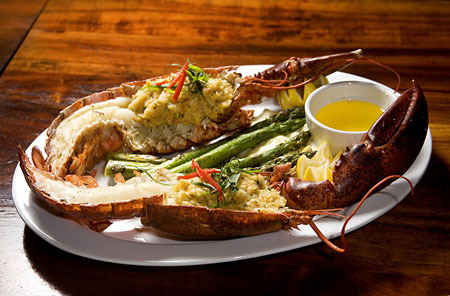 Like the image below. Simplicity is best! This worked like a charm. Thanks for providing a line reference for the code. I cannot figure out how to poat a photo. Can you help me get started? 1. Save your photo as jpeg on your computer. Thanks for the great tutorial. Follow-up question for you. Is there a way to make it so that it's always 400 pixels wide? I don't care about the height, but I would like the width to always be 400. Thanks again. 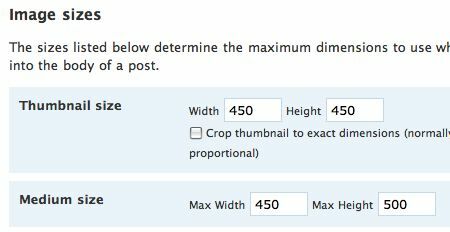 I don't want to edit my thumbnail sizes but I'd like to increase the upload limit of my images and the limited size. Currently it's on.. 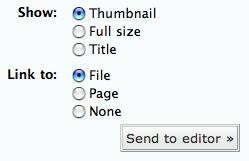 However, when I tried uploading an image larger than 1024 the thumbnail option wasn't available. Dumb question: Where do I find the wp-admin folder, exactly? Sorry for ignorance, thanks for the help! 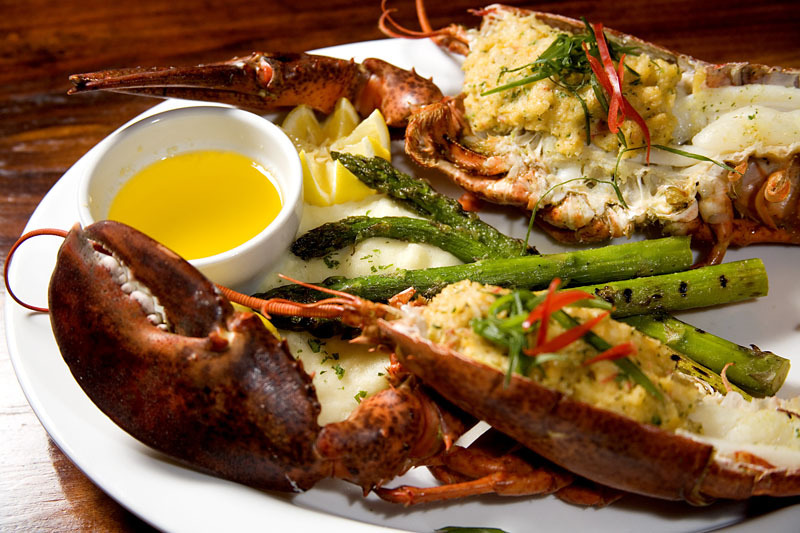 You will find it in the same directory as your blog address. So you'll see lots of files with wp- at the start of their filenames, with wp-admin being the first of those files. Thank you very much. Nice post and very informative. Before I try this I want to make sure it is compatible with WP 2.5. Also, do you know whether it will work when adding pics using image manager or other such plug-ins? For some reason I'm getting super tiny (like maybe 40px square) for thumbnails and can't figure pout why. I changed the settings in the Misc section for thumbnail size but it had no effect. I looked at my themes CSS and other files and couldn't see anything about thumbnails. (Though I'm no expert). 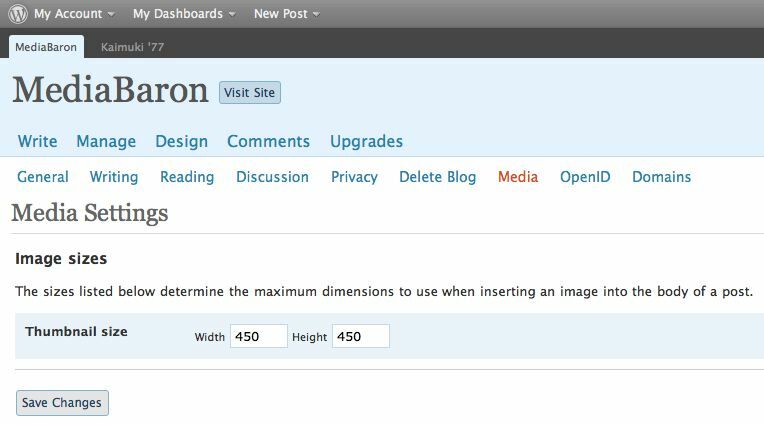 You don't need to modify the code anymore, WordPress has a setting for thumbnails. I just updated the info on this post. yaa baron is absolutely right…. In-depth view. Like it very much. I will follow these tips provided herein to examine its specific outcome after putting into use in real cases. Thanks from me. Ð›Ð°Ð²Ð°Ð½Ð´Ð°, Ð³Ð¾Ñ€Ð½Ð°Ñ Ð»Ð°Ð²Ð°Ð½Ð´Ð°. ÐÐ°ÑˆÐ¸Ñ… Ð´Ð½ÐµÐ¹ Ñ Ñ‚Ð¾Ð±Ð¾Ð¹ ÑÐ¸Ð½Ð¸Ðµ Ñ†Ð²ÐµÑ‚Ñ‹. Ð›Ð°Ð²Ð°Ð½Ð´Ð°, Ð³Ð¾Ñ€Ð½Ð°Ñ Ð»Ð°Ð²Ð°Ð½Ð´Ð° Ð’ÑÐµ Ñƒ Ð¼ÐµÐ½Ñ Ð·Ð°ÑˆÐ¸Ð±Ð¸ÑÑŒ Ð¸ Ñ ÑÑ‚Ð¾Ð¼Ñƒ Ð¿Ñ€Ð¾ÑÑ‚Ð¾ ÑÑƒÐ¿ÐµÑ€ Ñ€Ð°Ð´. Ð¯ Ð²ÑÐµ Ð²Ñ€ÐµÐ¼Ñ Ñ€Ð°Ð±Ð¾Ñ‚Ð°ÑŽ, Ð¿Ð¾ÑÑ‚Ð¾Ð¼Ñƒ Ñ‚Ð°ÐºÐ¾Ð¹ Ñ…ÑƒÐ´Ð¾Ð¹ Ð¸ Ð·Ð°ÑˆÑƒÐ³Ð°Ð½Ð½Ñ‹Ð¹.